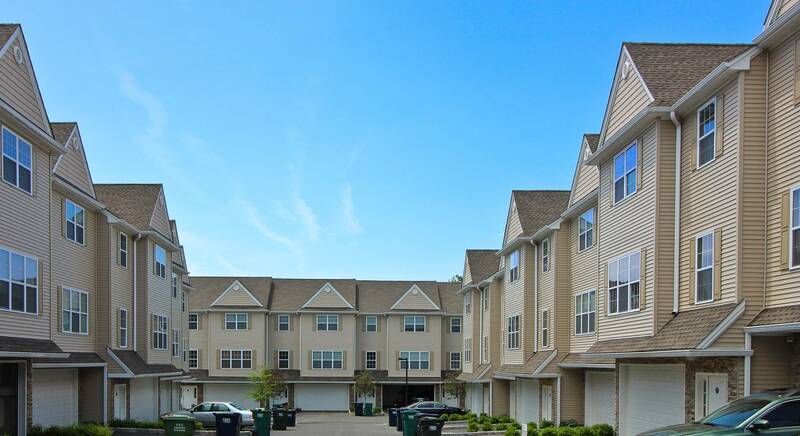 Ridgeview Commons boasts a great location in the town of Danbury, Connecticut. Built in 2015, these 2,100 square foot condos have three bedrooms and two and a half bathrooms. Kitchens are beautiful at Ridgeview Commons, with 9 foot ceilings, a breakfast nook, granite counters, and sliders that lead out onto the balcony. With an open floor plan, this space is great for entertaining. Bedrooms feature gorgeous vaulted ceilings and large windows that let in plenty of natural light. En-suite bathrooms feature extra large showers and tubs, some with double vanities. The walk-out basements are partly finished, and have garage and interior access. To make it all complete, pets are welcome at Ridgeview Commons! Right next door to Ridgewood Country Club, golf, tennis, and a pool are right in your backyard! Ridgeview Commons are located close to the New York border with easy access to I-84. Route 84 is the major East/West freeway which takes you to New York State to the West and Hartford, the state capital to the East. Downtown Danbury with the campus of Western Connecticut State University is no more than a ten minute drive as is the Danbury Mall with its department Stores and specialty shops. Danbury is home to many large companies such as Praxair and Boehringer Ingelheimer as well as 6,000 smaller employers. Danbury is growing faster than any other industrial area in Connecticut.